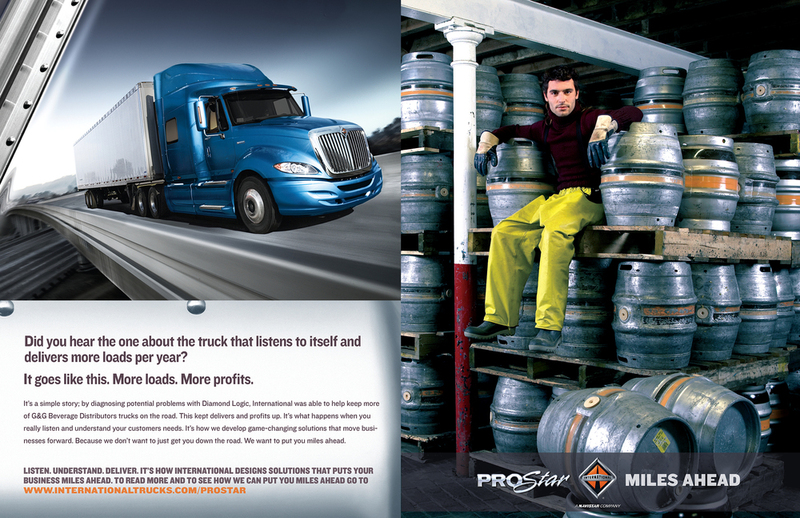 “Miles Ahead” campaign included brand ads designed to create a strong bond with International's external and internal audiences along with more product-focused ads designed to credit further engagement and lead generation. 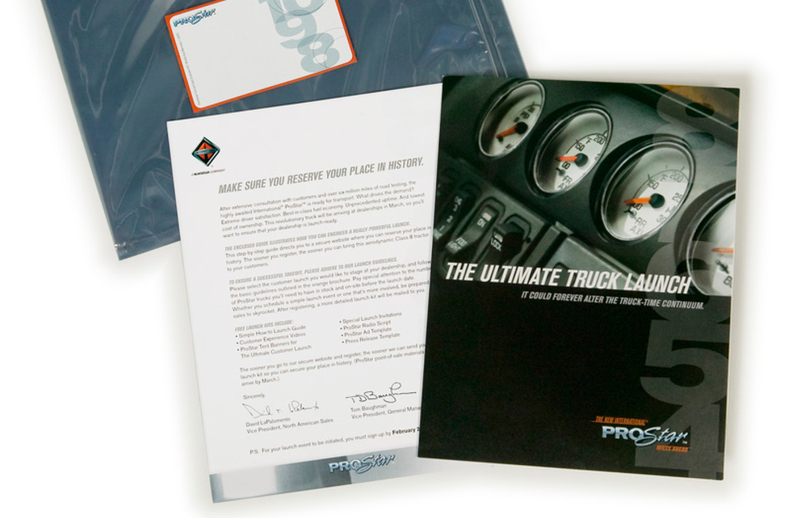 ProStar “Ultimate Truck Launch” event: Dealer Kit One was developed to get dealers excited and signed up to hold their event. Dealer Kit Two was filled with all the marketing event ingredients they needed for their dealership's “Ultimate Truck Launch” event. Commercial Hybrid Vehichle Dealer Kit: International wanted a unique way to congratulate Dealers on becoming the first to sell hybrid commercial vehicles that could also be a customer "display." RouteMax Dealer Kit: Designed to introduce this new refrigeration technology to dealers. 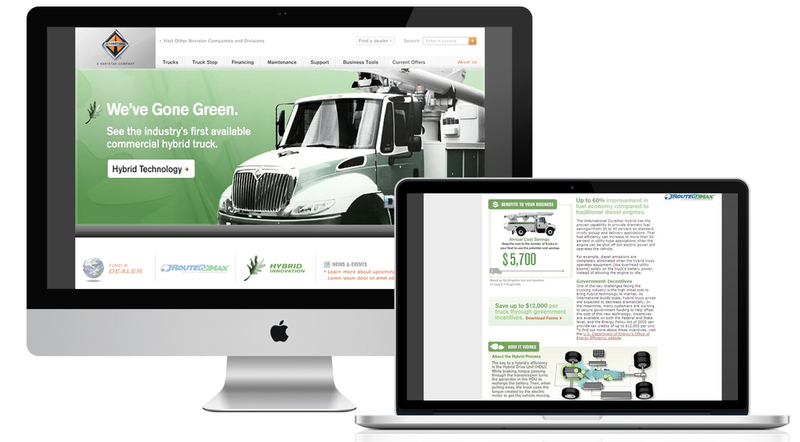 Digital projects included: International enterprise site, Navistar brands such as IC Bus Corp and Navistar Defense, microsites for vehicle centers, new trucks, products and services and promotional/event landing pages. Customers ranged from large fleets to small business owners to independent truckers, many of whom relied on the website to figure out which truck(s) was right for their needs. A truck finder application was developed that provided direction, filters and comparisons. Microsite for the new ProStar, the most aerodynamic, fuel efficient long-haul truck available. Interactive features developed to show impact. Microsite introducing the new Big Bore, a revolutionary new line of class 8 commercial diesel engines designed to improve International's reputation and presence in the market. IC Bus Corp, one of the many companies under the Navistar brand, offered a full line of school and corporate buses. A site was needed that could both communicate the overall brand as well focus on two very different product lines and customers.